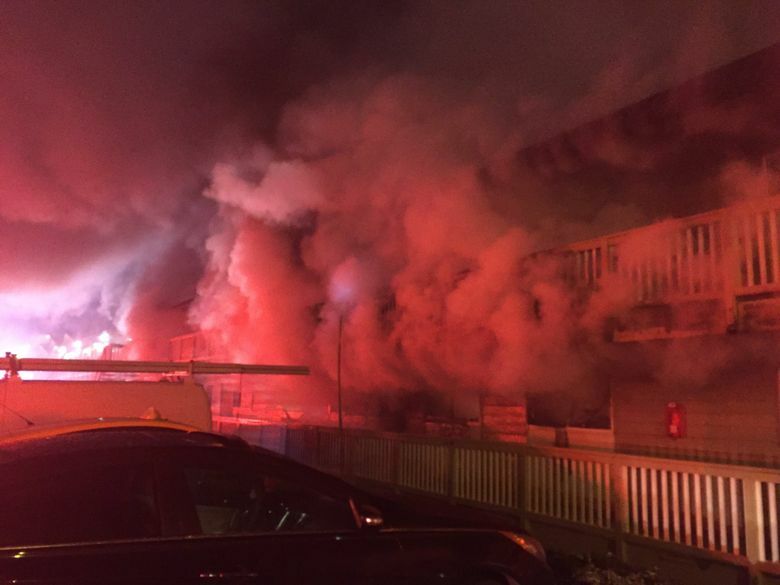 One person was injured and 44 people left homeless in a fire that damaged 18 units of a three-story SeaTac apartment building early Saturday, the Kent Regional Fire Authority said. The cause of the 1:20 a.m. fire in the 3200 block of South 192nd Street was under investigation. Fire and smoke were coming from the back of the second and third stories when the first firefighters arrived. The injured resident, a female, was found on the grass below the balcony of her second-story apartment, according to the fire authority. She was taken to a local hospital; her condition wasn’t known Saturday night. Firefighters mounted an aggressive attack against the fire because many residents were believed to be home and asleep, the fire authority said. Residents were able to evacuate and the Red Cross responded to assist those who were displaced, the fire authority said. The apartment-building management also helped by providing apartments nearby. King County Metro Transit provided a bus to keep residents warm and transport them to the other complex.